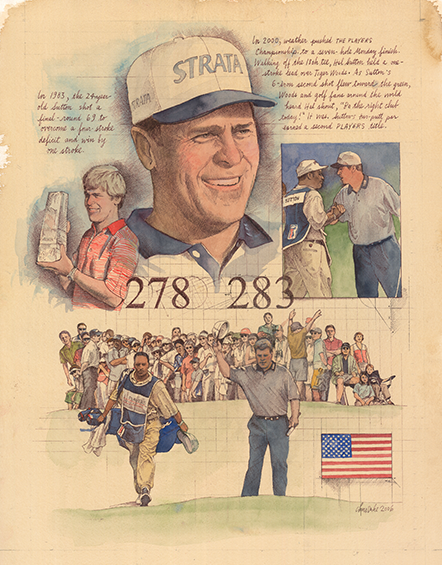 When he broke onto the PGA TOUR, Hal Sutton harbored a dream — to win a tournament against his heroes, icons such as Arnold Palmer, Jack Nicklaus, Lee Trevino and Raymond Floyd. “Even if it’s just one time,” Sutton said. No tournament would provide that opportunity quite like THE PLAYERS Championship, jam-packed with the best field in golf. And no venue would offer the sort of landscape for possibilities that THE PLAYERS Stadium Course at TPC Sawgrass would as it showed again in 1983 that it was the purest test in golf. During a wild fourth round, the lead changed hands 11 times and the door was opened for the 24-year-old Sutton to come from four back to post a one-stroke win over Bob Eastwood. Third-round leader John Cook struggled throughout, but still went to the 18th tee tied with Sutton, who had finished with a 3-under 69 for 5-under 283. “I was thinking three to win, four to tie,” Cook said. Instead, he hooked his drive into the water and made six. Considered to have been Rookie of the Year in 1982, Sutton used his win at THE PLAYERS to top the money list in 1983 ($426,668) and win Player of the Year honors. At the age of 24, Hal Sutton became the youngest winner to date in what can only be described as a crazy final round at TPC Sawgrass. Nobody foresaw what would transpire on that Sunday. The lead changed an incredible 11 times. With greens and fairways rock hard and the wind blowing, Sutton came from four shots back to pass the leaders which included John Cook, Bobby Clampett, Vance Haefner, Peter Jacobsen, Ben Crenshaw and Don Pooley at any given time.